Hervé Guibert, detail of photograph. The prose fragment is a form capable of kindness. After I thought of that sentence, I thought of reading Hervé Guibert again, with students, this quarter. In his use, the fragment has so much discretion all along its edges. We all exist beyond those edges. It’s like sending a note when a call might be intrusive, or stepping aside the right degree, to make way but not to shun. It’s not that his writing is especially interested in kindness, but, in writing and photography, he is interested in recognition, both the kind you can accomplish steadily, and the kind where you flinch away. 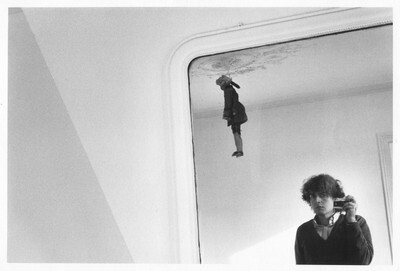 This is a Guibert self-portrait, from 1981. Yesterday I was thinking about Degas. And wondering about his hands when, late in life, he could barely see. I remember reading in a wall text at the Metropolitan Museum that one of his friends helped him to feel a painting he was curious about. What I wondered yesterday was how the paint felt to his fingers, if his hands felt steady to him. I think of steadiness of hand and steadiness of gaze going together. The fact that my hands feel unsteady to me lately seems related to how much I flinch away, from what I am reading, even from watching peoples’ faces. In every news article, in the faces of people crossing the street, I seem to see great vulnerability, that we are menaced. Here is an essay by Guibert I didn’t know about. 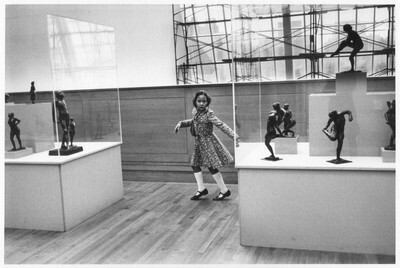 It is a photograph, the joint effort of the subject and the photographer to understand, among other things, Degas. Some day, I hope I will write about the way the picture reflects on Degas’ ideas about the brave efforts of our bodies, about drawing and sculpture and form. But my hands are a little unsteady today.